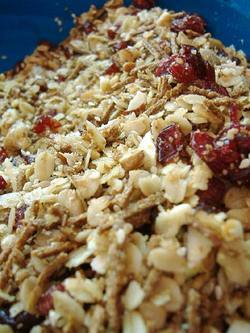 Combine dry ingredients (except for cranberries) in a large bowl and mix well. Combine wet ingredients (oil, honey, vanilla, etc) in a small bowl. Pour wet stuff slowly over the dry stuff and mix well. Spoon ingredients into a large cake pan and bake for approximately 60 minutes at 300° F, stirring every 15 minutes. Remove from pan, return to bowl, and mix in the dried cranberries. Allow to cool. Keep in an airtight container. Refrigerated will last for a good long while. This is such good granola, it's almost the kind of snack you could eat all by itself. Just grab a handful and munch. But I like it best with strawberries and cherries, and a dollop of vanilla yogurt. YUM! This granola sounds delicious. Thanks for sharing the recipe.